Last Saturday Pastor Alfred Paul, from the village of Fiervil in the mountains east of Tricotte, came to visit me. He walked for three hours, having heard that we may be able to do an eye clinic. He shared that he has many people in his church that struggle with their reading due to poor eye sight. I hadn’t planned to do an eye clinic on this trip but I couldn’t say no so I told him I would free up Wednesday morning at 9:00 and be able to see up to 25 patients. I also told him not to spread the word or we would have multitudes to deal with and I just didn’t have the time for more. Well by 6:00 Wednesday morning Pastor Alfred’s people were beginning to gather out on the street in front of our house. By 9:00 there were 26 gathered — he wondered if that was okay that he had one extra and I accepted. 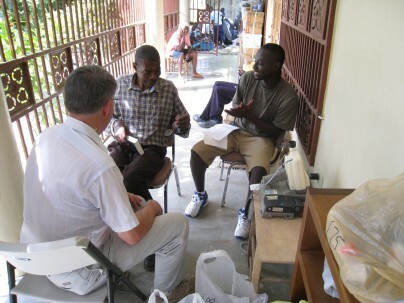 So at 9:00 my interpreter, Garry Charles and I started seeing patients. I always explain to them that I am not a doctor and that I can only diagnois minor needs. However several years ago we were able to purchase a RETINOMAX machine due to the generosity of some of you. This machine enables me to do a fair job of determining the patients need. By 12:30 we had seen 39 people. It is such a joy to see their faces light up when they see clearly for the first time in a very long time. One man couldn’t remember when his left eye was injured but it was since he was a little boy. I could not get a reading on that eye at all. So as I was going to the glasses inventory I prayed that God would lead me to the right pair of glasses for this man. God did and oh the excitement on this man’s face as he could see well. And the bonus was — they were bifocals and the reading part was perfect for him as well. God is so good!!! The generosity of many of you who have donated glasses has made clinics like these possible. We are grateful to God for your contributions. If anyone has unused glasses you would like to donate, we will see to it that they are used to meet the needs of Haitians like the man from Fiervil. (If you are able to attach the presciption, that is very helpful as well). Some of you may remember Bernie writing in a newsletter four years ago about a young man named Nodi. It is such a blessing to see how God continues to lead young men like him. 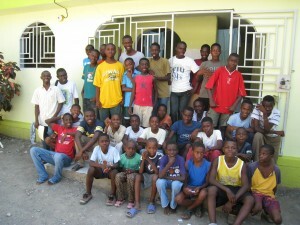 Since Bernie’s newsletter, Nodi has gone to plumbing school in Port-au-Prince. And right now he is back in Tricotte, using the things he has learned, giving back some of what he has received. Glenn has been giving Nodi plumbing tasks in the orphanage, as they work to improve the water supply there. But Nodi doesn’t stop there. He has been at the house where Glenn and Bernie stay, cleaning up and lending a hand wherever he can. We thank God for Nodi and the things God has done in his life. On Saturday, Bernie and Glenn, along with Exalus, who works with our schools in Haiti, visited Remoussin, a village about a mile downriver from Tricotte. Exalus was concerned about some cracks that had been developing in the school building since the earthquake. Glenn had been to Remoussin in February, and at that point there was no visible sign of damage. But Exalus was right; there had been damage and there are substantial cracks now. It appears our best option is to take down the building are rebuild. In the village of Ravine, the school was in great shape, but the church building requires repairs, which we have now begun. And in the village of Means, the church (which also housed the school) had become so bad they had already taken it down. The 130 school children in Means are now meeting under a coconut leave shelter. We need to build a new school there. There may be other construction and repair needs as well, although these were the ones Exalus and Norius were most concerned about. Glenn & I are having a great time in Tricotte. It had been six months since we were here. Glenn has been working on the village water system. He’s installing two new 1600 gallon water tanks in order to increase the storage capacity. We currently have indoor plumbing for our girls in the orphanage but didn’t have the capacity for the boys — so this is going to get the boys the much desired indoor plumbing as well. 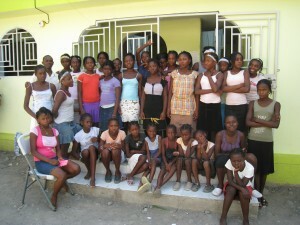 This morning I helped distribute clothes at the orphanage. The kids were excited. They don’t often get new clothes. Some friends in Susanville, California put together a new “dress” clothes package for each of our kids and today the kids received it. Tomorrow we will be giving out new shoes as well. The kids thanked me over and over again and I pass that on to you. This area of Haiti hasn’t had any significant rain since November. The recently planted crops are suffering and will fail if they don’t soon get some moisture. Please pray that God would provide the much needed rain. Thanks much. Bernie called from Haiti this afternoon. He sounded upbeat and energized to be back ministering to and with many old friends. He had a window seat on the plane as he flew into Port-au-Prince Wednesday. As the city came into view, the thing the struck him most was all the blue. Blue? As they descended, he realized that the blue was tarps, make-shift shelters all over the city providing the only protection for thousands of Haitians from sun and rain. On the ground was more of the same, a giant tent-city of tarps and anything else desperate Haitians could scavenge to provide a bit of shelter. In an email/website update on April 21, we shared a bit about how we’re moving into the next phase of earthquake relief, as we begin the process of helping families rebuild homes. And we wanted to expand a little more on how we are approaching that.